which can then be harnessed and used to heat your property. The advantage of using a ground source heat pump is its high efficiency. For every kWh of electricity used to run the heat pump, around 4 kWh’s of energy is produced some of the newer inverter driven heat pumps can achieve 5 kWh’s. This ratio of heat supplied from the ground and the electrical energy consumed is called the Coefficient of Performance or (CoP). With a standard heat pump, £1 of electric gives you £4 worth of energy and an Inverter heat pump can produce £5 of energy from the same. Boreholes are our preferred method of extracting heat as the temperature of an average borehole is 6*d higher than a loop collector system which during the heating season makes a difference to the units efficiencies. 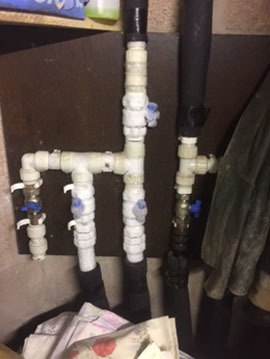 A manifold connects the pipework to the boreholes which range from 100m to 300m deep. As a general rule 2 140m boreholes will yield the same energy as 600m of trenching, so giving you the scope to install a heat pump in lot smaller area. Greenfields have excellent working relationship with several of the top drilling contractors to ensure you receive the most cost effective and professional drilling solution. Using long lengths of 40mm or 45mm MDPE is the most common way to extract low-grade heat from the ground. The length of this pipework will be dictated by the soil type and its thermal response, location and the properties heating demand. Using water as the heat source is an option, as running water or a large body of water will have excellent heat transfer qualities and its temperature is stable throughout the year giving a high yield per length of collector. Open loop systems are the most economical and efficient option for a large scale systems providing you have an appropriate water source i.e. Sea, large river, lake or aquifer, most of the large scale megawatt systems in Europe are powered by the Sea. Some ground source heat pump manufactures may recommend using high density coils of collector pipe called Slinkies. Whilse this form of collector can be deployed in appropriate ground conditions, Greenfields strongly recommends the use of one of the above options. As manufacturer improved installers we are often employed to complete remedial repair work to third party installations, a considerable amount of this work is as a direct result of Slinkies freezing the ground, there is no cheap repair for frozen ground. The picture to the left shows a frozen manifold supplied by an undersized slinky array. As the ground had frozen the only option was to drill 3 boreholes and abandon the slinkies altogether. 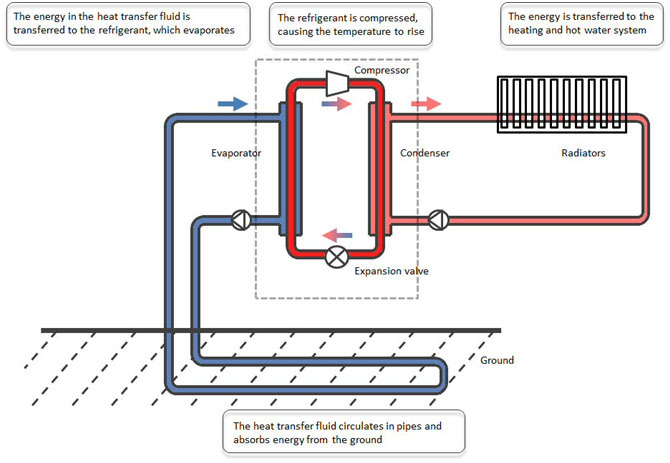 The ground is usually around 6 – 12ºC in the UK,, the collector system harvests this heat through the collectors and pumps the low grade heat into the Ground Source Heat Pump where it is compressed it to give you high grade heat 35 – 60ºC (up to 70 ºC on some of the high temperature heat pumps) which is then used to heat your property and provide hot water. A well designed heat pump will generally reduce energy bills especial when compared to other off grid alternatives. As a rule of thumb, your town gas, LPG or oil system with give you .90p -.97p for every £1 you put into it. Although you will pay less for a kw/h of gas, and oil, with the higher COP the heat pump it will still work out significantly cheaper. For more information on the RHI, please contact our office. A budget quotation can be produced from a current EPC. If this is acceptable a more detailed site survey will be completed to verify the system specification. Greenfields have a wealth of experience, designing and installing bespoke air source heat pump systems including docking to existing fossil fuel systems or combining with other renewables technologies such as Solar Thermal, Solar PV and Air Source Heat Pumps. Do you have space for a ground loop array as a general guide you will need 3 times the foot print of your property. For bore holes you will need to be at least 7 m from any building and then 9 m apart. In older properties the insulation levels are frequently low. This means that at very low external temperatures, the radiators may need to run at temperatures higher than those which permit optimised heat pump efficiency. This will affect your RHI. You have to a SCOPE of 2.9 in order to get RHI, this does not mean that a heat pump cannot deliver excellent results in terms of heating and savings against fossil fuels but some other remedial works might be required. Greenfields has extensive experience of installing ground source heat pump systems in all types of buildings, and has unparalleled understanding and know-how in designing and installing solutions in all property types. In some projects, it may be more cost effective to integrate a heat pump with a fossil fuel boiler. This is one way of accommodating higher flow temperature for high hot water usage and heating requirements also for preserving the ground temperature in the winter months. Greenfields have installed some of the largest heating, cooling system either passive or active, in the UK . Passive cooling operates by reversing the operation of the collector field, this replenishes the ground whilst simultaneously cooling the building. Active is where it gets interesting by using a cooling vessel instead of the collector field we can cool and heat simultaneously once the cooling vessel is satisfied we revert back to the ground collector, once the heating demand is satisfied we replenish the ground collector. This can deliver excellent COP’s, fuel savings and significant carbon emission reductions.